Perhaps the most curious of all the decimal coins of the British North American provinces is the New Brunswick half cent. It was never ordered, nor indeed even required, by the colony! In 1859-60 both New Brunswick and Nova Scotia adopted a decimal currency system. The Nova Scotia government, however, wished to keep British silver in circulation as well. It set the value of the British pound at $5.00, which made the British half crown worth 62 1/2 cents and the sixpence worth l2 1/2 cents in Nova Scotia currency. Thus, when either of these coins was offered for payment in Nova Scotia, a half-cent piece was often necessary to make change. But in New Brunswick the value of the British pound was set at $4.86 2/3, the same as in the Province of Canada and the United States. 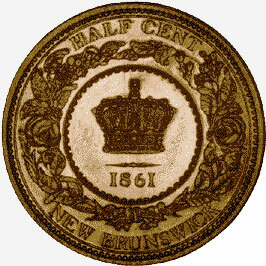 This decreased the value of the British coins sufficiently that no half-cent pieces were needed in New Brunswick. In 1861, when filling orders for Nova Scotia half-cent and one cent-pieces and for New Brunswick one cent-pieces, the Royal Mint in London by mistake produced both denominations for both colonies. Some 222,800 New Brunswick half-cent pieces were struck before the error was discovered. Most of the coins were still at the mint and were melted; however some, perhaps several thousand, are believed to have been shipped to Halifax with the Nova Scotia half cents. The coin illustrated is part of the Bank of Canada's National Currency Collection.